Support the on-going development of Homer3 and AtlasViewer by purchasing high-resolution precomputed sensitivity data. This enables access to higher fidelity fluence data without requiring the computational investment of performing local fluence simulations. 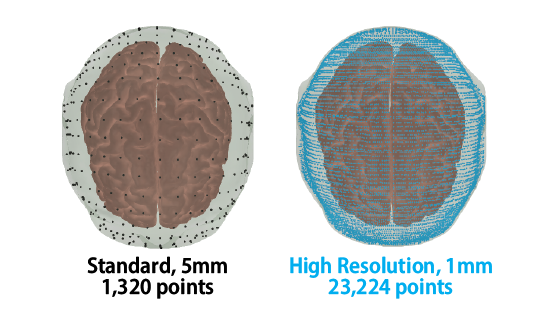 The high-resolution fluence profiles have a resolution of 1 mm, as opposed to the 5 mm packaged with AtlasViewer. The high resolution sensitivity data offers simulation data points for 1 mm resolution. The high-resolution files are compatible with the next release of AtlasViewer, and will be available to purchase once the release is live. Join our newsletter to be notified about the availability of high-resolution sensitivity profiles.